​Like some call Jay Kay 'Jamiroquai', Robin is our Jamiroqueen. Jamiroqueen is Russ's brainchild, and he would like to thank Toby Smith. Josh is also guitarist with Lounge Fly, and he uses the same pedal as Paul Turner. Russ is a veteran of the Colorado music scene with several concurrent projects. Auxiliary percussion, synthesizers, and Ableton. Matt is essentially Jamiroqueen's percussionist, string line, horn line, and arpeggiator, which is about 8 musicians in Jamiroquai. Andrew teaches steel drums to hundreds of Colorado students, is a member of Pan Nation, and plays the same drum kit as Derrick McKenzie. Jamiroqueen is a tribute to Jamiroquai, the world famous British band releasing number one hits since the 1990's (recall the guy with the hat on the moving floor and the infamous dance scene from Napoleon Dynamite). Fronted by a charismatic and shamanistic woman who leads the way with her voice and stage presence, Jamiroqueen does the disco funk genre justice by churning out hits that keep audiences dancing through the night, spellbound by the catchy melodies and virtuoso performances of the band. Bring your dancing shoes! In 2012, keyboardist Russell Dobda felt a wave of energy while sight reading a Jamiroquai song book that had been sitting on his shelf untouched for years. As a senior member of the Austin Jamband scene seeing a trend of these acts realigning to tribute their inspirations, Russell saw the marketability and genuine entertainment value of tributing a world famous cult classic acid jazz dance band whose multiple number one hits everybody recognizes even if they can't place. 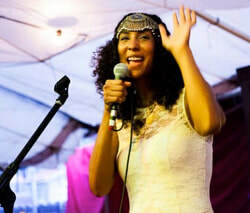 After finding Robin Bruce, a Jamiroquai fangirl since the age of 14, a 6-piece Jamiroqueen animated venues and festivals in the Austin area until the duo moved to Boulder in 2017. In 2018, Robin & Russell watched their idols play a sold out show in New York City and decided to reform the band in Colorado. All the pieces came together and Jamiroqueen was reborn in 2019. Bass Guitar 2012-2013. Dustin was the founding Jamiroqueen Bassist. Played with Loose Leaf; now he's in the Navy. Enzo was the founding Drummer & Backing Vocalist from toast through Jamiroqueen 2.0. Last seen at Le Voyage. Red Tony is also the founder of Burning Flipside's RedCamp. ​He how plays with Funkotron. Clay was the Drummer for Jamiroqueen 3.0 and a founding member of Dimitri's Ascent.